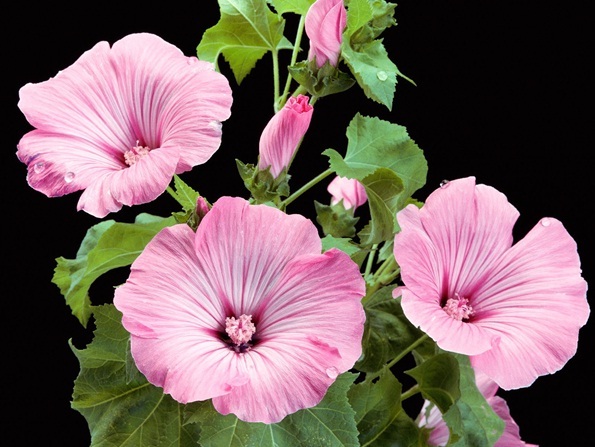 Lavatera, often better known as ‘Mallow’, belong to a genus consisting of annuals, biennials, herbaceaous and evergreen perennial shrubs that grow wild throughout the world. In their natural environment, they grow on poor, stony soil, often in coastal areas and are ideal for a drought tolerant garden or where watering is a problem. They produce large, usually pink flowers in large numbers from early summer to mid-autumn. Annual mallows are also available in white. The blooms are attractive to bees and other pollinating insects. The plants are easy to grow, vigorous and grow to 2m in height with a bushy habit. ‘Barnsley’ is a popular variety. They are ideal as fillers in the herbaceous border and make excellent cut flowers. 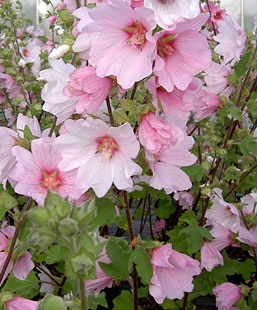 The annual type, Lavatera trimestris, can become untidy later in the season and may need to be pulled early. The perennials need to be severely cut back each season to encourage new flowering growth, otherwise they will produce non flowering, brittle stems. Propagate by seeds, the hybrids by cuttings. Cuttings can be soft stem, semi-ripe or hardwood, they produce roots very easily. Prune perennials hard each year. Drought tolerant, grow in sunny position in dry soil.